Nakiris has double bevel knives designed specifically for working with vegetables. Nakiris are characterized by their flat profiles and squared off tips. This makes these knives ideal for push cutting and chopping but awkward for rock cutting. Nakiris are often ground thin to optimize performance and benefit from a refined cutting edge. Nakiri:A Nakiri is a vegetable knife. 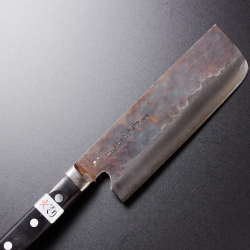 Under utilized in the Western kitchen, the Nakiri’s flat blade..